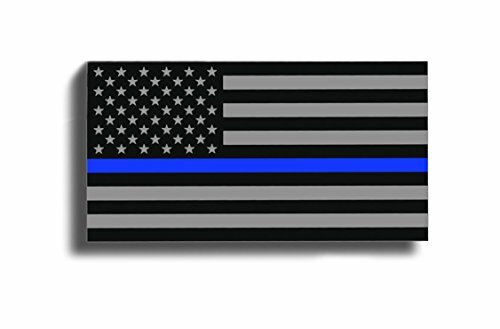 You are get ONE Blue Line American flag vinyl sticker. They are Black, Blue and Gray. The sticker is 4 inches wide x 2 inches tall. They are printed on 3M vinyl and laminated with a High Gloss laminate. They will last for years on the back of your car, truck front door of your house, windows, laptop, locker, wall, toolbox, ANY SMOOTH DRY SURFACE etc.... They are STICKY on the BACK so they have to go on the OUTSIDE,.... These DO NOT APPLY from the inside, once again ONLY sticky on the back. If you have any questions about this product by 215 Decals, Graphics, Skins & Stickers, contact us by completing and submitting the form below. If you are looking for a specif part number, please include it with your message.